Salt and Chocolate: Is it Summer yet? I have had enough of this snow and enough of this cold weather. I should really think about moving to a warmer state. I remember as a child loving to go outside in the cold and snow and play for hours while my mother worried I would get frost bite even thought I was bundled up like Randy, Ralphie's brother in A Christmas Story. But now I don't even want to go walk to my car which is in the garage, or walk to my building at work which is probably on a bad day 20 ft. I don't know what happened between then and now but I can tell you one this I wish it was summer right now. So in honor of wishing the snow would melt and the temperature would rise to the 80's I am turning a summer time treat into a winter dessert! Smores scream summer to me, as you cook them outdoors over an open fire preferably with sticks that you found. But that is hard to to when the temperature isn't even rising above freezing. So I'll be thinking summer time thoughts as I eat a steamy bowl of this bread pudding. I hope you will join me in wishing this horrible winter away! Preheat oven to 350 degrees. Spray a 3 1/2 quart baking dish with non stick spray Heat cream, half and half, vanilla until it comes to a boil then turn it down to a simmer, mix in 10 oz of milk chocolate and stir until combined and completely melted. Then set aside to cool. Chop the bread into 1 inch cubes and set aside in a large bowl. In a bowl mix the egg yolks, sugar, and salt together, add in the warm cream mixture and whisk to combine. Pour the custard mixture over the bread and stir to coat every piece and let it sit for 10 minutes. 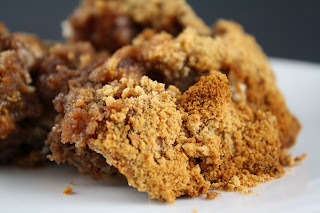 Then pour into the baking dish and top with marshmallows and then the graham cracker crumbs. Bake for 50-55 minutes or until the top is light golden brown and the custard is pretty much set. I think next time I would use more marshmallows and put some on later as they disappeared into the bread pudding. And Please vote for my Keep the Doctor Away Drink. Click Here to Vote! I'm with you to do summer dishes when it is so cold. This bread pudding looks so good. Oh my...that bread pudding looks amazing! What a great idea. Love your blog! Bread WITH marshmallows and chocolate? Oh, I am soooo there. This souds amazing! I have to admit, I'm a sucker for anything that contains marshmallows. Yum! I absolutely love "smores" desserts! This looks and sounds DE-LISH! Thanks for sharing the recipe!!! Btw, what did you do with your egg white? How did you "save" them for another day? THX! 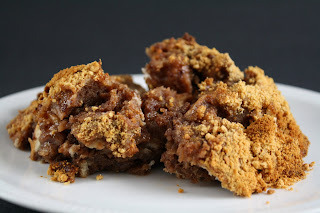 I love the idea of a bowl of s'mores bread pudding! Delicious and ingenious, this is the kind of clever dessert that won't last long in my house!